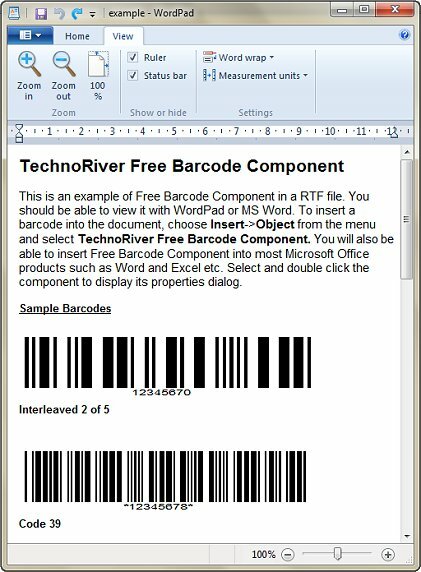 Free Barcode Software Component allows you to easily add professional quality bar codes to documents like those from Word and Excel. The barcodes are generated as Windows Metafile that allow accurate, high resolution printing to any printer.The Component will work flawlessly with any Windows application that supports OLE (Object Linking and Embedding) Server, or any applications that allows pasting of WMF files. This includes most (if not all) Microsoft Office products, WordPad and many third-party softwares.Simply insert the Component into your application and select a few bar code properties, such as bar code height, bar width, barcode type and bar code orientation. Your desired bar codes will be generated automatically.The Component exposes a full range of barcode properties and allows precise control over barcode dimensions. The font for the human readable text is customizable, and support for various barstyles allow the text to be placed on top or below a barcode symbol. The text can also be left-aligned, centered, or justified. Data validation is also carried out over all input to ensure the generated barcode meet industry specifications.Free Barcode Software Component supports Code39 and Interleaved 2 of 5 and ITF14 barcodes. It also includes an Excel Add-in for mass conversion of data to barcodes. Draw multi overlay image, text on live video or save to video file. User define transparent color, alpha value.